Chocolate Beef Stew you say?!? Anytime there is chocolate for dinner I am all for it! A few years ago Sandra Lee had a Valentine's Day segment on Semi-Homemade that used chocolate as the special ingredient for her Valentine's Day dinner. She had a recipe for chocolate beef stew, and chocolate vinaigrette for salad. I recreated this meal for my girlfriends one year since we were all single that year for Valentine's Day. Everyone loved the beef stew (the chocolate vinaigrette was a little strange), and so this recipe has become one of my staples, and a staple for some of my friends as well! It's such a super easy recipe that you can quickly put in the crock pot and enjoy later in the day. It’s a great recipe for busy families. It's also a great conversation starter to tell your guests they are eating chocolate for dinner! 1. This does not taste at all like chocolate, so I hope that doesn't disappoint anyone. 2. You use unsweetened cocoa (or bittersweet chocolate like the original recipe, I just substituted cocoa since that is what I had on-hand), so it is not sweet at all...just very savory! 3. 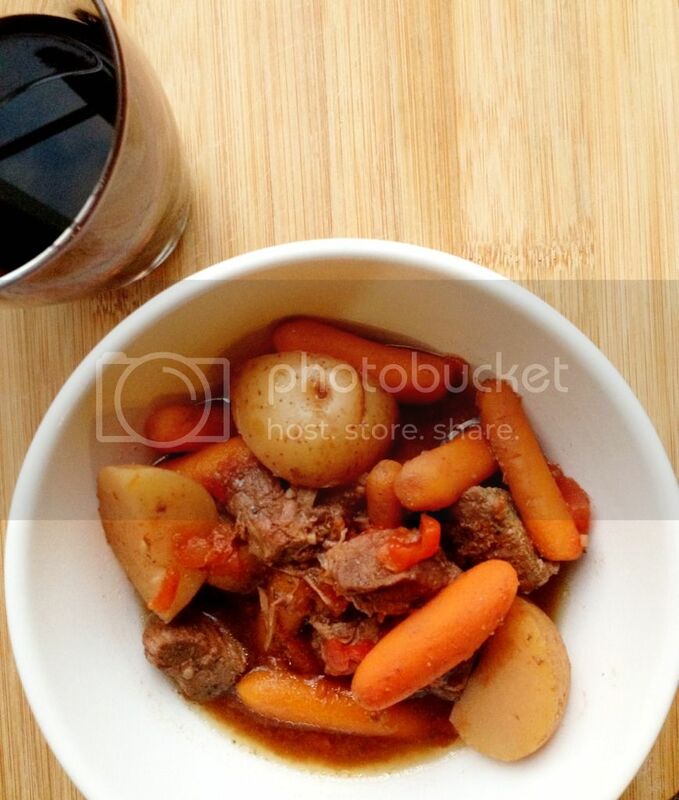 The red wine and the chocolate help to make a nice rich sauce for the beef stew and make the dish very flavorful! This recipe is just something you have to try and is a very easy, but impressive dish to serve to your dinner guests! Just tell them they are having chocolate for dinner and I bet you they will RSVP right away! Place beef in slow cooker. Sprinkle with salt, pepper and seasonings. Add the carrots, potatoes and tomatoes (I included the juice). Then add in the beef broth, red wine, some more seasonings and the cocoa. Stir the seasonings in a bit and then cover and cook on HIGH setting for 6 to 8 hours. Adjust seasoning with salt and pepper. Serve hot. Enjoy! Yes, this seems like an easy recipe for beef stew. I've used cocoa powder in other recipes to add, as you said, a special richness. I've used it in chili and in apple cake.